It's Fashion Month again and after a quiet few editions, the industry seems to have reignited its enthusiasm for playing around with tech for S/S 2019. That means everything from connected health devices worn under designer garments to experiments with virtual models and make-up. We've seen a few well-timed announcements like Snap's new Nico and Veronica Spectacles frames, but here's what we've spotted so far from the official line-ups. We've smushed together New York Fashion Week and London Fashion Week for the purposes of this fashion tech roundup. The Paris and Milan Fashion Weeks are still to come, so we might see some more fashion tech experiments yet this season. The biggest tech headlines out of London Fashion Week have gone – quite wonderfully – to Elvie. The connected health startup's new breast pump, the Elvie Pump, was worn by model and mother-of-two Valeria Garcia at Marta Jakubowski's S/S19 show. Mums can wear it under their bra and express milk silently, plus the Pump connects to a smartphone app for you to monitor milk flow and pumping sessions. We spoke to Elvie just before LFW and CEO Tania Boler told us about its plans to have four female health devices out by 2020, following the success of their Elvie Trainer connected pelvic floor muscle device, which we reviewed last year. The Elvie Pump goes on sale in October. It's not quite the true tech implants of biohackers but celebs including Kim Kardashian, Chrissy Teigen and Queer Eye's Tan France were showing off temp tech tattoos for NYFW, as part of Simon Huck's A. Human exhibition. Kardashian's 'alien' necklace 'implant' definitely glows in the dark from the look of the pics and she posted that the tech choker's LEDs move to the rhythm of her heartbeat in one of her Instagram Stories. It's unclear how it actually works at this stage – this sort of fashion tech project has been done before with heart rate monitors – and hey, who are we to doubt a Kardashian? 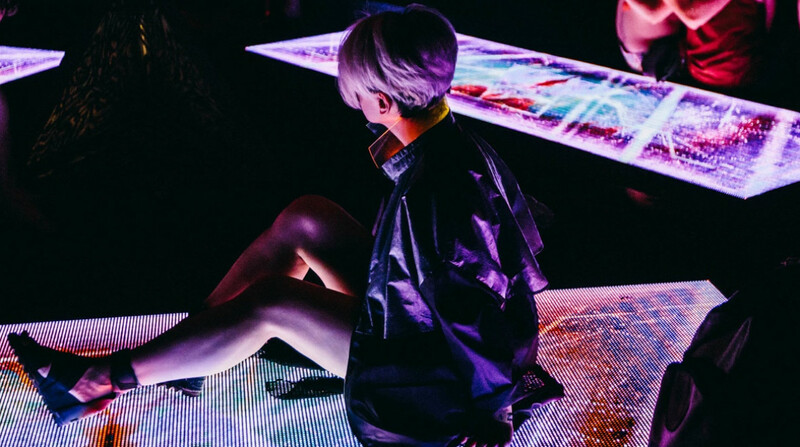 On Canal was a fashion tech and VR hub over the course of NYFW, with pop-ups including Jonathan Rosen's interactive smart mirror, 3D scanning from Beheld and Wearable Media's modular, sensing and data-generative e-textiles and smart garments including its new Meter line of streetwear that responds to sounds. Also on show, LAByrinth's biotech fashion pieces (including jewellery featuring DNA suspended in a glass vial, because why not) and a VR installation from the Digital Museum of Digital Art. Back to London and the Fashion Innovation Agency from London College of Fashion has given us a Microsoft HoloLens fashion show and no less than a whole augmented street in past seasons. This time around, the FIA worked with CLO and The Fabricant to virtually recreate a beautiful, embroidered bomber jacket, designed by Sadie Clayton, which was stolen back in 2016 by a scammer 'stylist'. The project is a sneak peek into the future of virtual shopping and mixed reality garments that the FIA is calling "hyper-real fashion". Take a look at the video to check it out. The New York Times is following on from its brilliant series of VR projects with its first volumetric AR experience for New York Fashion Week, available within the NYT app for iOS. It features a moving 3D hologram of model and activist Ashley Graham and is intended to promote body positivity, in that there's no PhotoShop or other altering of Graham's face or body, and the tech allows you to see her from all angles. Put together using over 100 cameras and Microsoft technology, she appears to be in the room with you. Pretty clever showcase, if you ask us. Who even needs humans? At the Honee show, the LA-based designer used an Ohmni robot alongside real models to display her S/S 2019 collection, named AI both for obvious reasons and for the fact that it also means 'love' in Vietnamese and phonetic Chinese. OhmniLabs' rolling telepresence robot took to the catwalk at the Millennium Gloucester London Hotel, and was covered in crystals alongside garments made from silk, cotton, leather and feathers. The designer told the BBC that it was "hell" dressing the robot for the show, but it appears that Ohmni sponsored the show so it was probably worth it.